This director's service agreement is a complete legal and practical framework for the employment of any executive director, whether on a running contract or on a fixed term. It is an employment contract for senior level staff that also defines the relationship between the director and the organisation. Provision for remuneration and common benefits is included, as is strong protection of company information. Today a company is under a statutory obligation to provide written terms of employment to a director, as to any other employee. 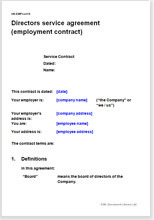 It is advantageous to both sides to set down the package in an employment contract (for director's, also known as a director's service agreement), rather than in just a few words from the company. This director's service agreement provides a complete legal and practical framework for any executive director. It covers all the requirements for an employment contract of a board member as well as clarifying the relationship between the company and the director so as to prevent conflicts of interest. The service contract is particularly strong on the protection of confidentiality and company secrets. All common perquisites such as salary and benefits are also covered. Use of plain English makes editing easy and allows it to be understood by all parties. Recommendations of Department of Labour.